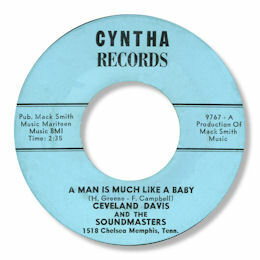 I can't get enough of these Memphis deep soul items and the obscure Cleveland Davis' A Man Is Much Like A Baby certainly fits that description. Happily the music lives up to the bill. Davis has a pleasant light baritone vocal and he is backed up by some excellent gospel based harmony singers. The rhythm section keep the song going nicely with the guitarist deserving a special notice for the fine arpeggios, and the horns, used very sparingly, make a strong impact when they do come in. Beware - this one grows on you with each play. The producer is rocker Mack Allen Smith and judging by his recording schedule this 45 was probably recorded at Lyn-Lou in Memphis.